Notes: Developed by Denny Rickards, of Fort Klamath, Oregon. Denny is a stillwater specialist who conducts seminars throughout the West on how to fish stillwater situations for maximum results. Crowley Lake and Bridgeport Reservoir are a couple of his favorite Sierran destinations. Denny has built a reputation of catching a number of very large trout yet he only uses about 5 fly patterns that he developed for stillwaters. His A.P. Emerger is one of those flies. It is a generic pattern that represents emerging mayflies or damselflies depending upon the coloration and size used. 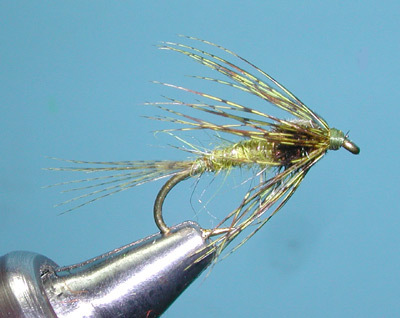 He has also found success with this pattern on streams with emerging caddis and other mayflies. The pattern was developed in the early 1990's and was tied to a 2x long nymph hook such as a Daiichi 1710 or TMC 5262 in sizes 10-14. 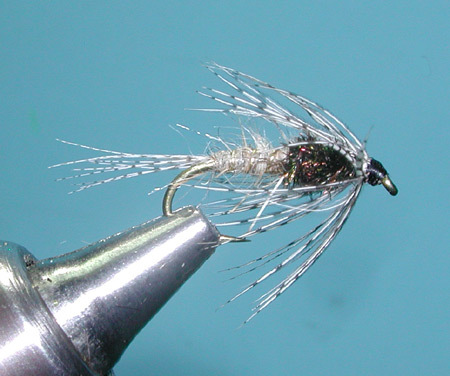 Within the last decade, however, many have adapted this pattern to a 1x long, 2X Heavy wire nymph hook such as a Daiichi 1560 or TMC 3761 as well as a wider range of sizes from 8-16. 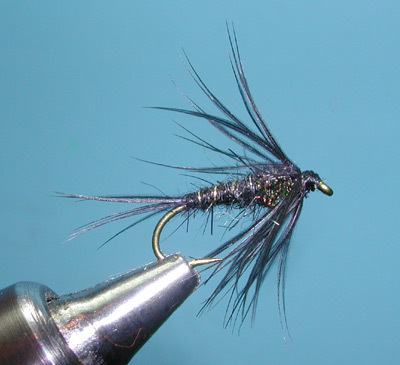 The shorter hook length works particularly well for callibaetis imitations and provides the strength to resist bending by especially large trout. 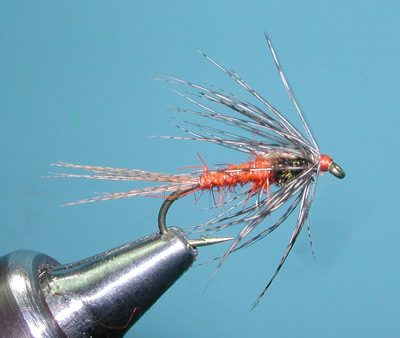 This pattern is particularly effective when trout are feeding near the surface on emerging insects. Within stillwaters, Denny prefers an intermediate sinking line or a 5-7 foot clear sink-tip line for this pattern. Apply slow 4-6 inch pulls. Variations off this pattern include substituting peacock herl with ice dubbing and utilizing colored tinsel for the ribbing providing an attraction element to the pattern.